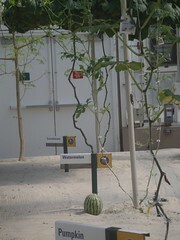 Living with the Land is a boat ride through greenhouse rooms. There is a wheelchair boat that you can roll right onto. They kept insisting to wheel Mik on and off, but they we like training someone that day and took way longer to maneuver him off than necessary. Would have been much smoother if they had just said he has to go on and off backwards and let me do it rather then the inexperienced them. Mik was a trooper and actually did not fuss, but that is the kind of thing that would usually annoy him. 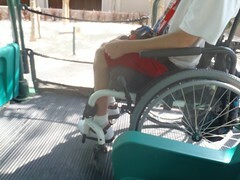 Instead he got annoyed at the elevator taking so long to get down to the ride and back out of the building after. Both Mik and I did not know what to expect from the ride, but ended up really enjoying it. Mik like the view he was able to get with the chair being on a platform level with the edge of the boat instead of being down like the seating. It was actually quite smooth and he would later learn that the other boat rides at WDW were not. Good thing we did this one first, though, as otherwise he might have been too freaked to do it and this was actually a very interesting ride we were surprised we had never checked out before. 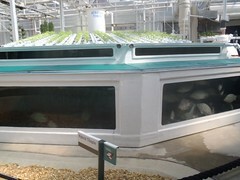 As you go through the greenhouse the narration talks about the various plants being grown and the fish being raised. A lot of it is experimental stuff and quite interesting, such as the growing of normally ground plants in a way that they hang down and with hydroponics instead of dirt.